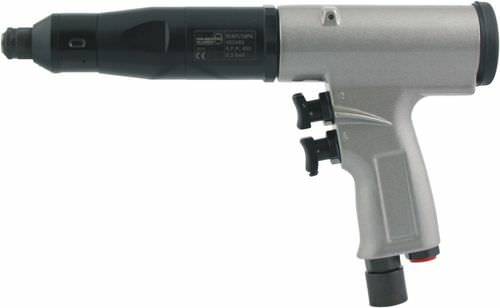 SD 401 are one of the pneumatic screw drivers which are in pistol form with a shut off valve. The chuck is safe and easy to use due to a quick change feature. These have high torque in the range of 7 Nm to 24 Nm. The performance is constant through out the life of the product with a long tool life. The torque repeatability is very high with ±5% shut of accuracy. An arm stand is recommended for high torque values and the extra handle reduces the torque reaction. Lubrication of air is not mandatory for this tool.